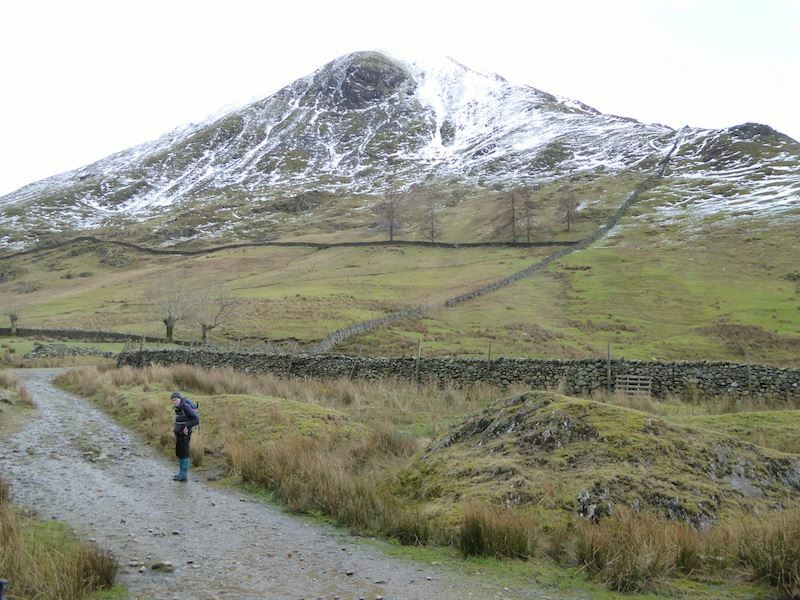 Starting out from Hartsop village we’re taking the path alongside Pasture Beck, Hartsop Dodd in the background. 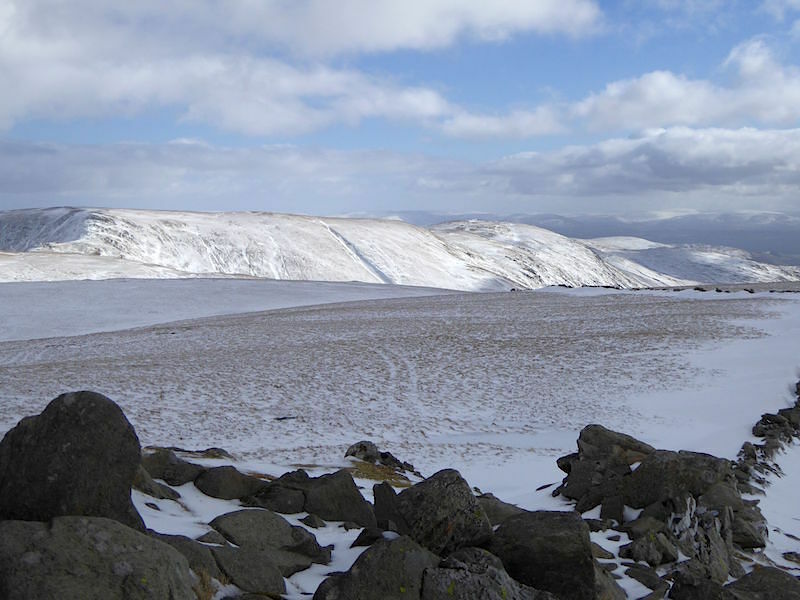 Across the valley is Gray Crag. 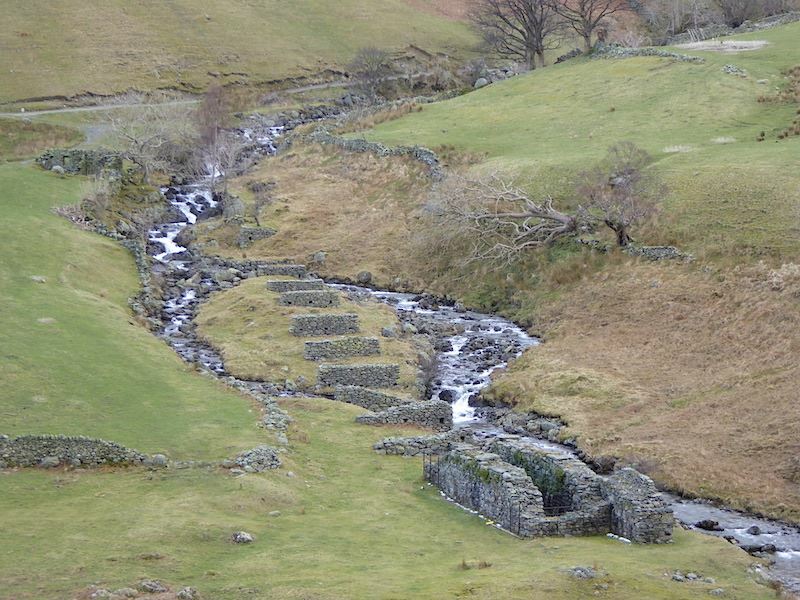 The derelict workings of Low Hartsop Mine, also known as Myers Head Mine. It was worked for lead for about three years but was a commercial failure and it closed in 1870. Brock Crags across the valley. 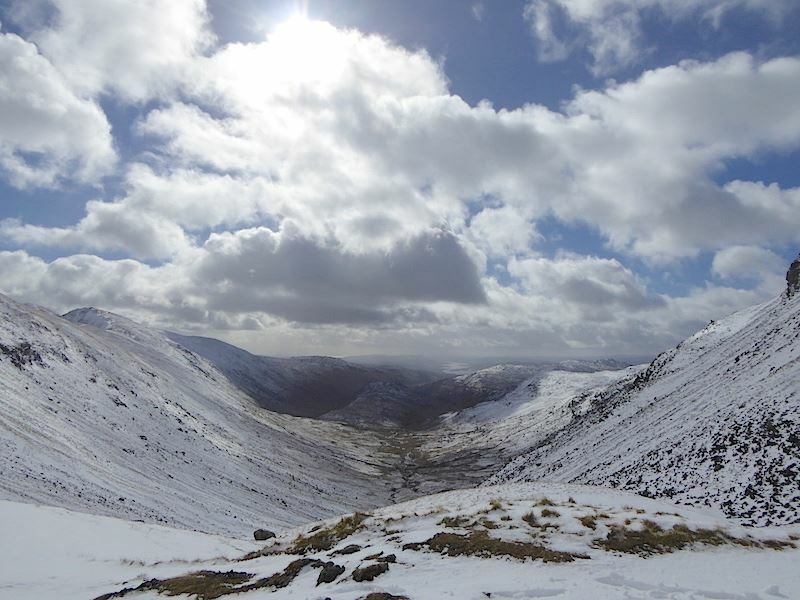 Looking up the Pasture Beck valley and wondering how deep that snow is up there. 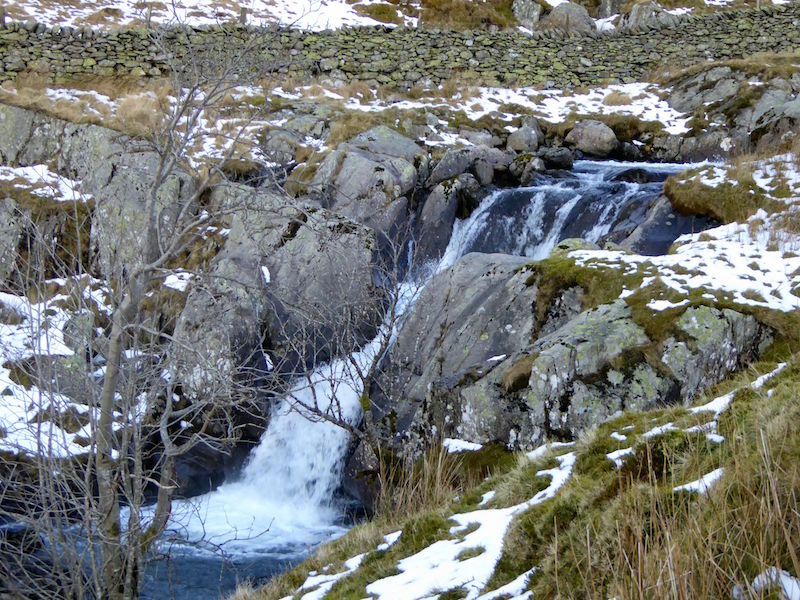 Pasture Beck, plenty of water flowing down today. 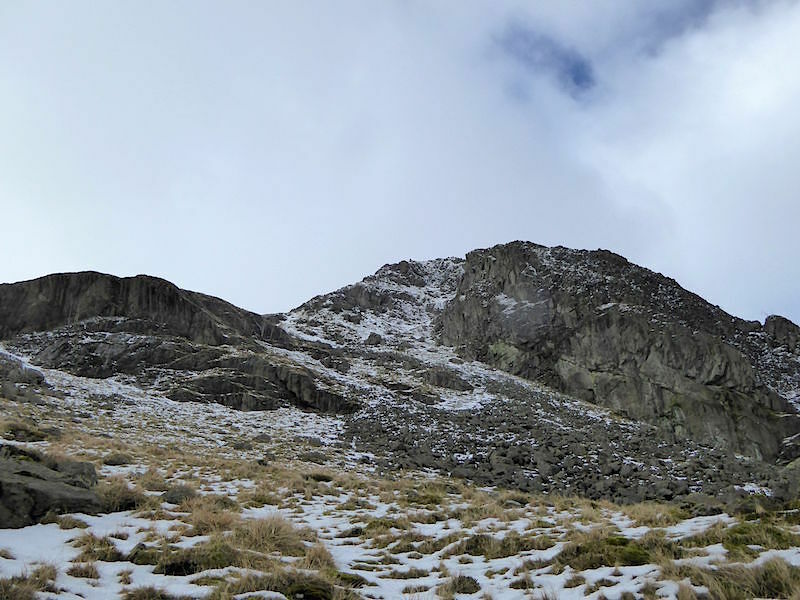 Raven Crag towering above the path. 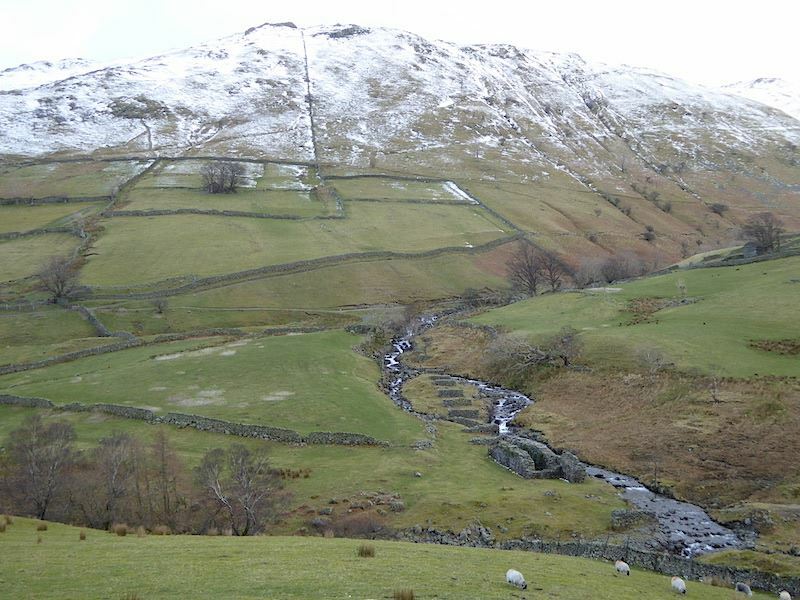 The other side of Raven Crag from further up the path. Just a little further along the path we began to hit the snow. 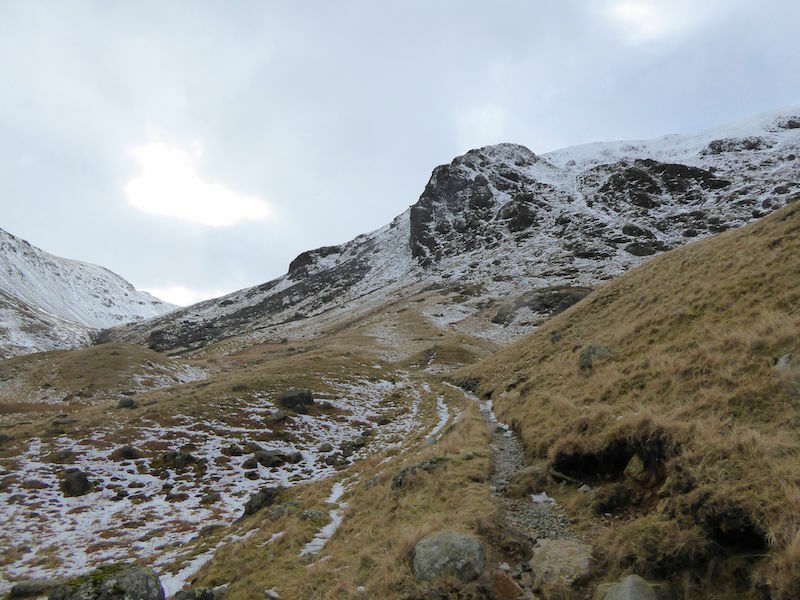 The path started to rise up to Thresthwaite Mouth, the snow was knee deep but fortunately one other person had already gone before us this morning and we were able to follow and use the footprints. I don’t think they followed the actual path but we were grateful that they were there. 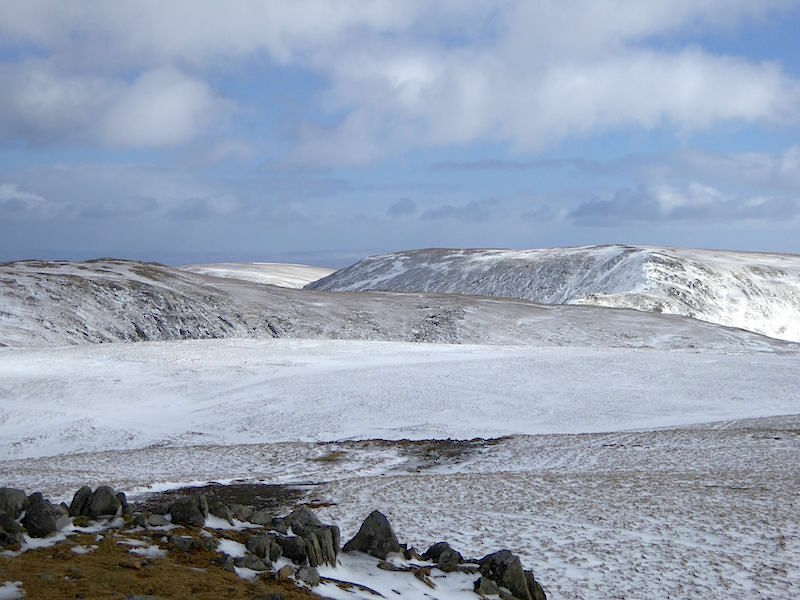 From this point the camera went back in the bag and I concentrated solely on getting through the snow and up to Thresthwaite Mouth. 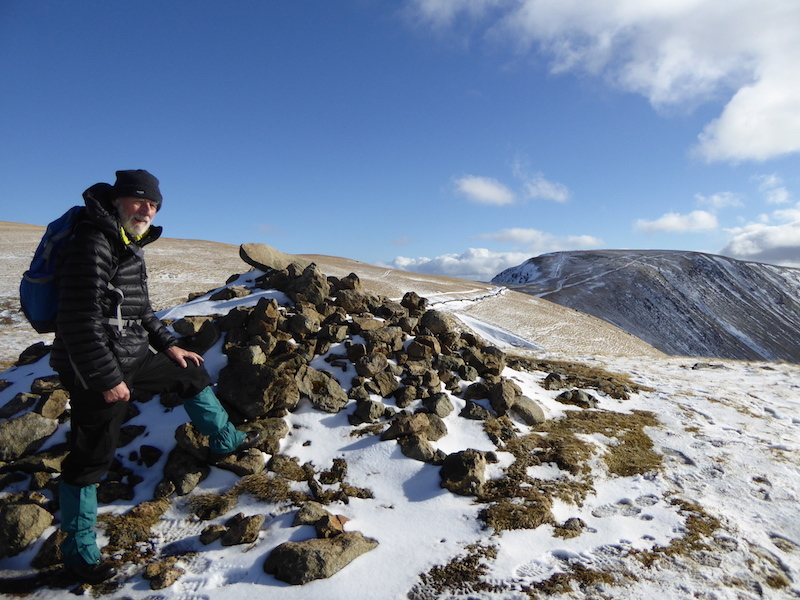 After a very hard climb through the snow we reach Threshthwaite Mouth and treated ourselves, and our legs, to a short break. Even with footprints to follow the climb up to here was very demanding. 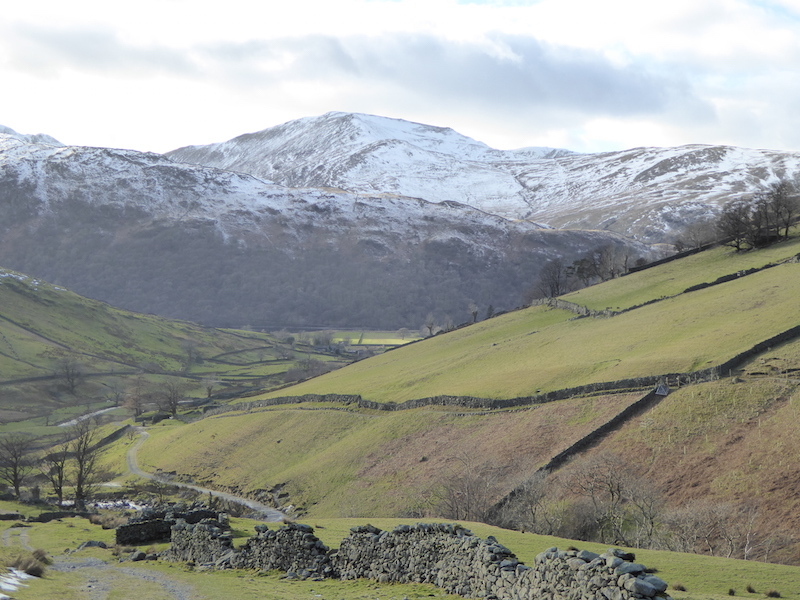 From there this is looking down the Troutbeck valley with Troutbeck Tongue just visible in the dark area in the centre. 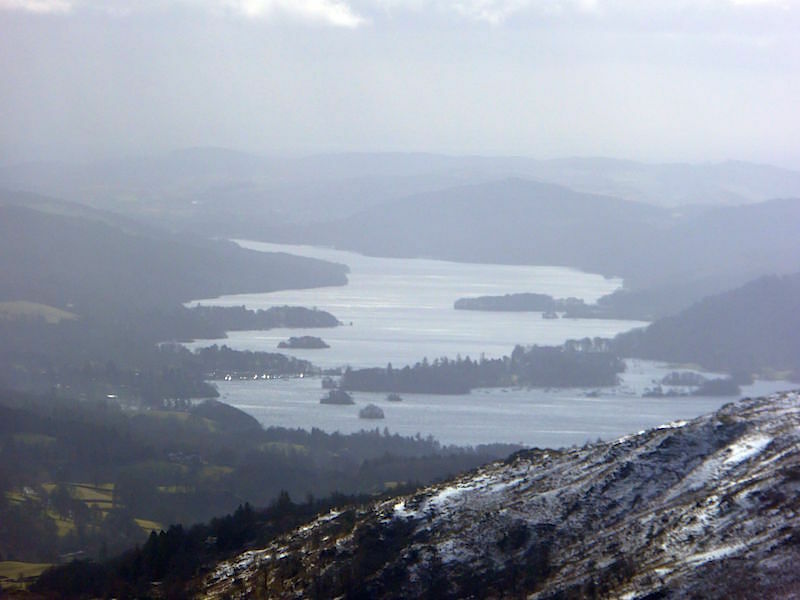 A close up of a very misty Windermere from Threshthwaite Mouth. 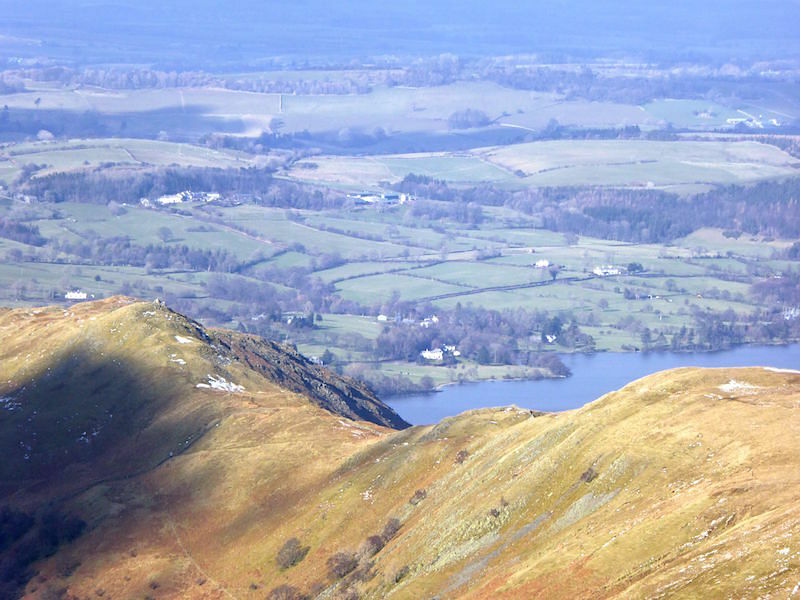 Looking down the Pasture Beck valley, which have just walked through, from Thresthwaite Mouth, a glimpse of Ullswater in the centre. 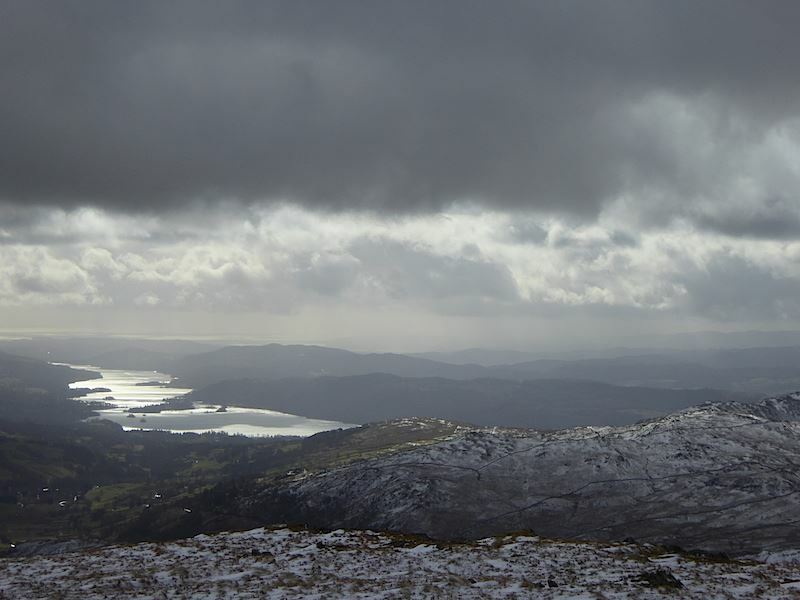 Windermere shimmers in a patch of sunlight. 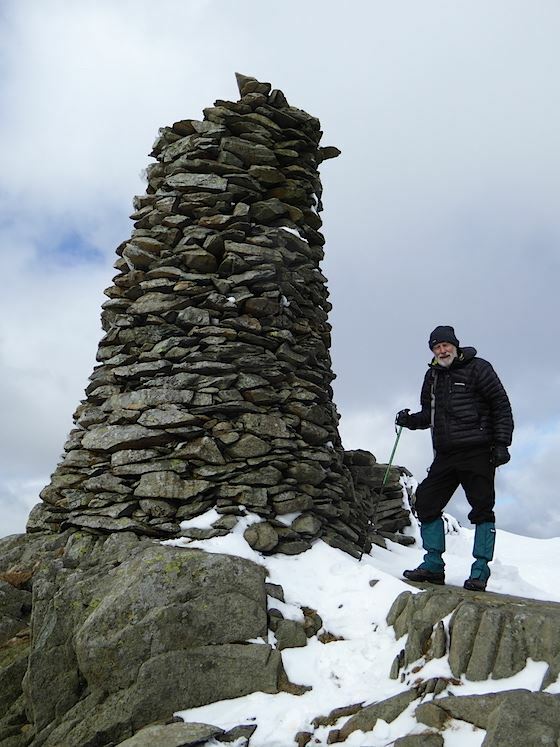 Having got our breath back we started out to climb the almost vertical path from the col up to Thornthwaite Beacon, again in the same conditions as the first leg of the walk. 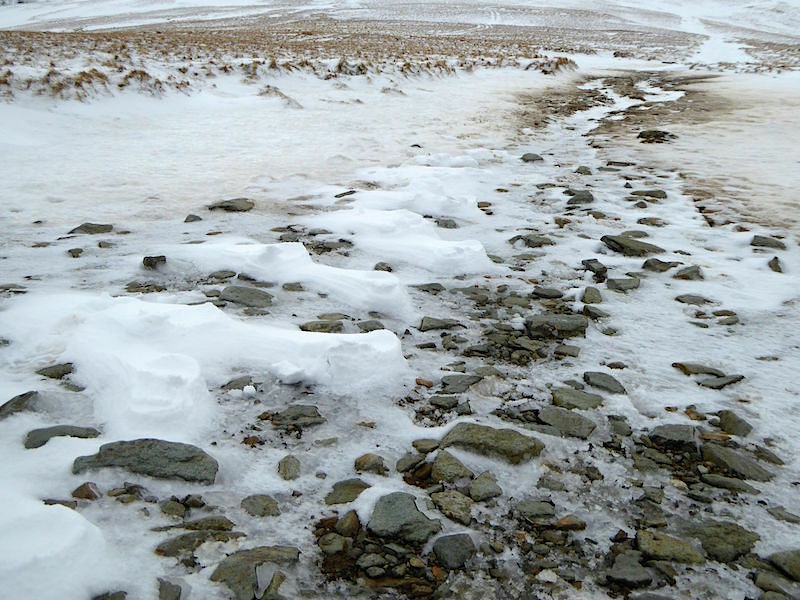 Thankfully the first walker had taken the same route and so once again we were able to follow the footprints. 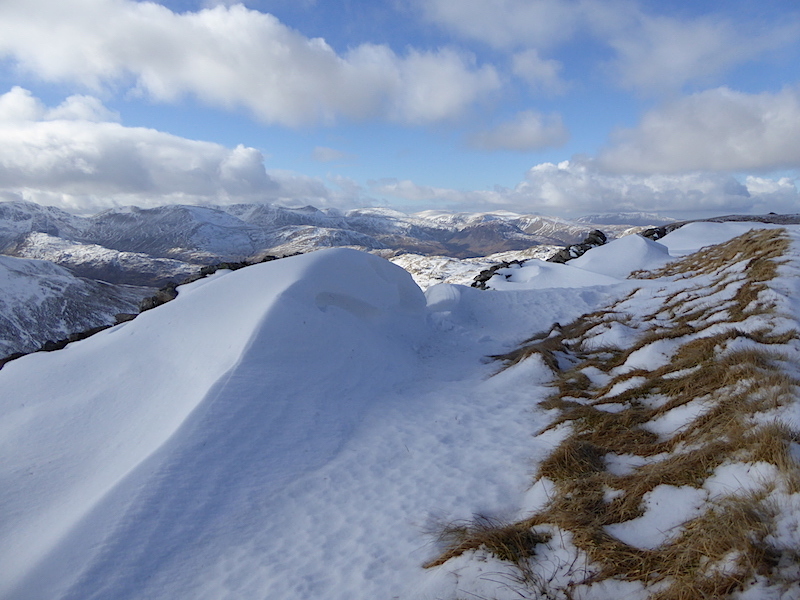 This path is hard going at the best of times and today wasn’t the best of times as the snow was very deep and covered everything except the most prominent rocks and outcrops. 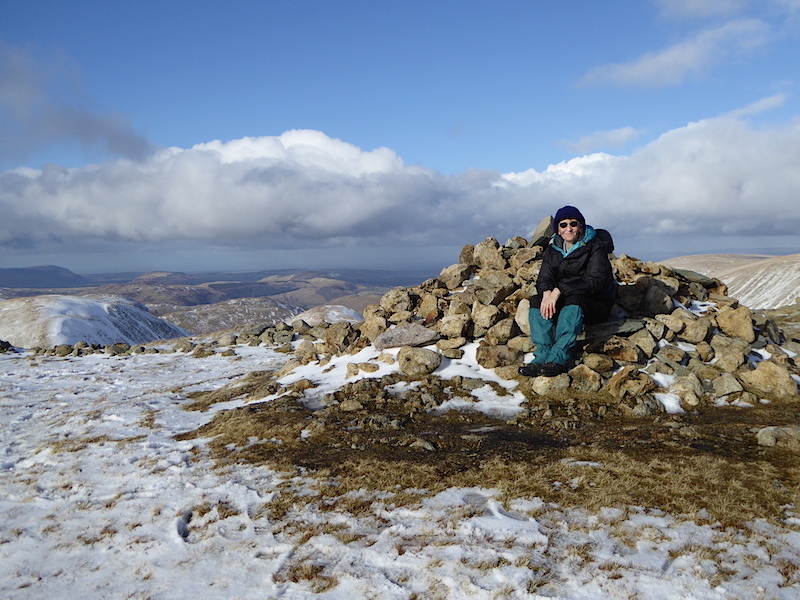 It took us 50 laborious minutes to do a quarter of a mile or so up to the top where we were grateful for the chance to sit down and rest our very weary legs. 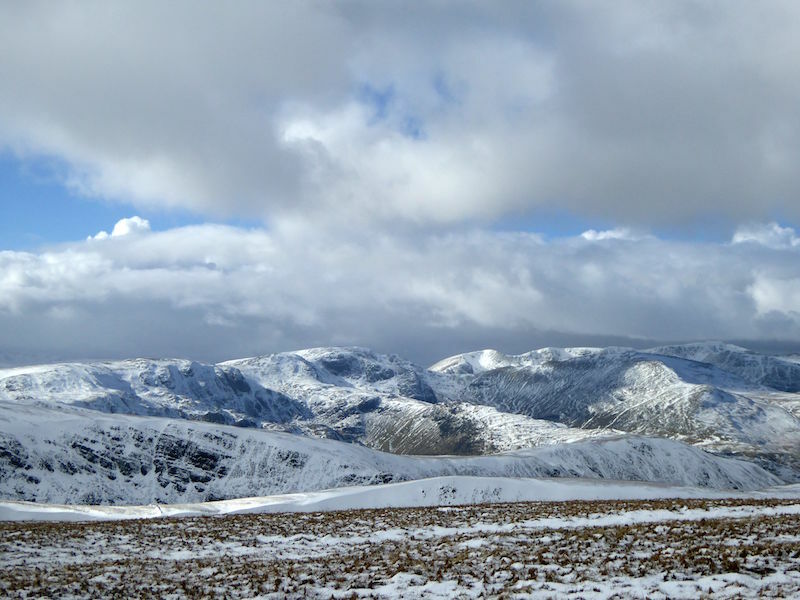 From Thornthwaite Beacon this a view across to Harter Fell, Kentmere Pike and Shipman Knotts. 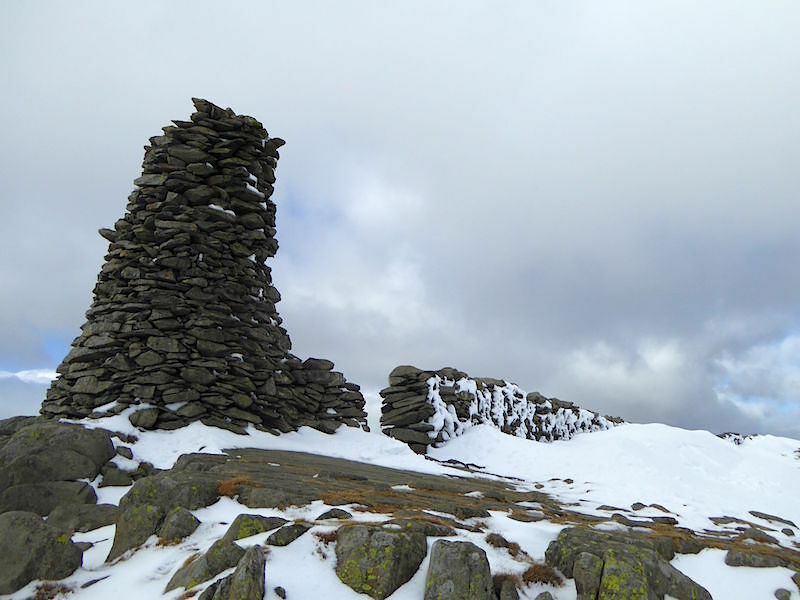 Thornthwaite Beacon looking in danger of collapse from this angle. 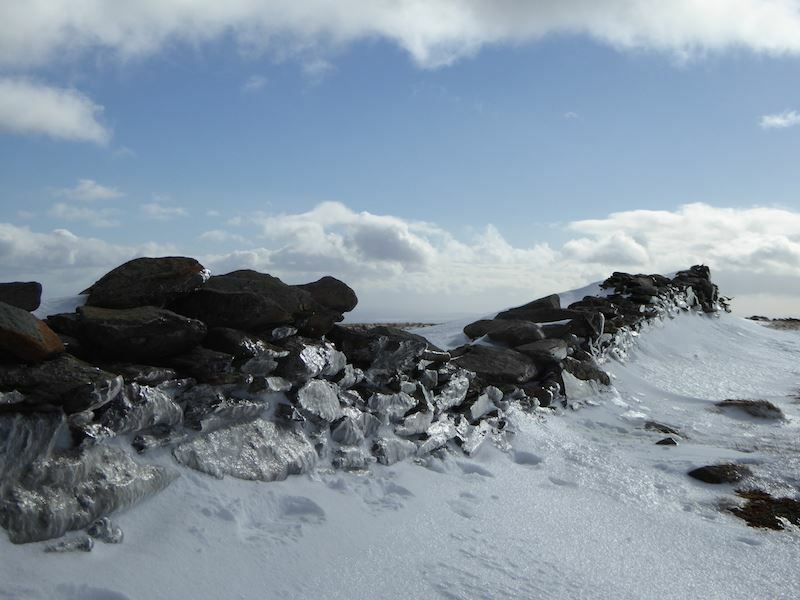 We had our lunch break sitting just below the beacon, all the while being peppered with ice particles which were being blown off it. The lean of the beacon doesn’t look so ominous from this side. 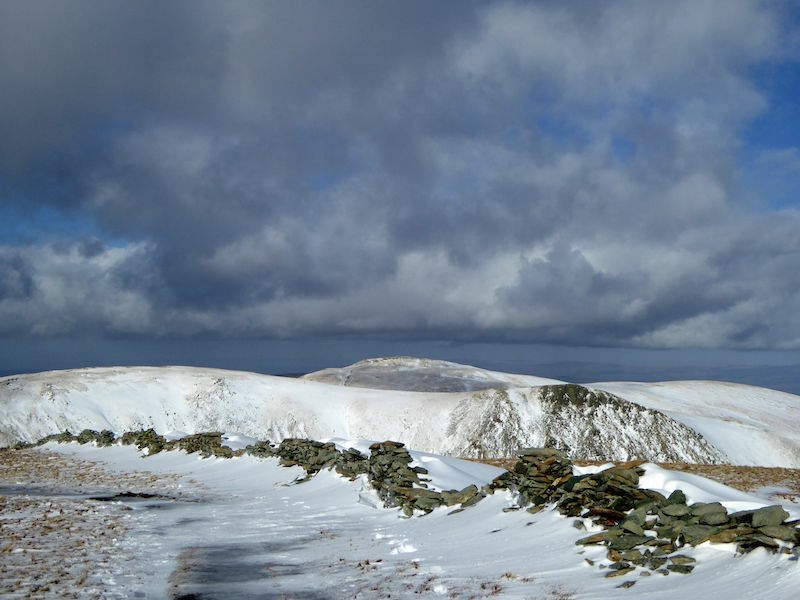 From the beacon a look across to Mardale Ill Bell on the left and Harter Fell to the right. 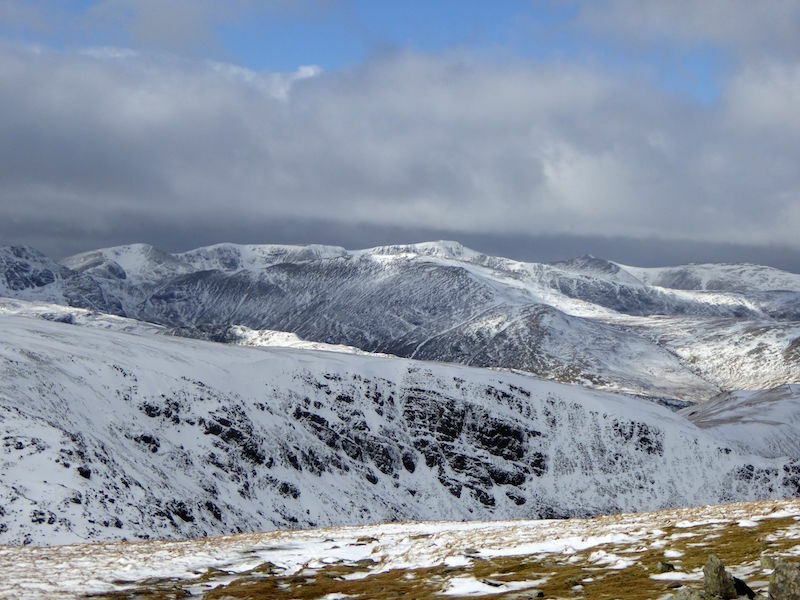 Still at the beacon but now looking over to High Street. 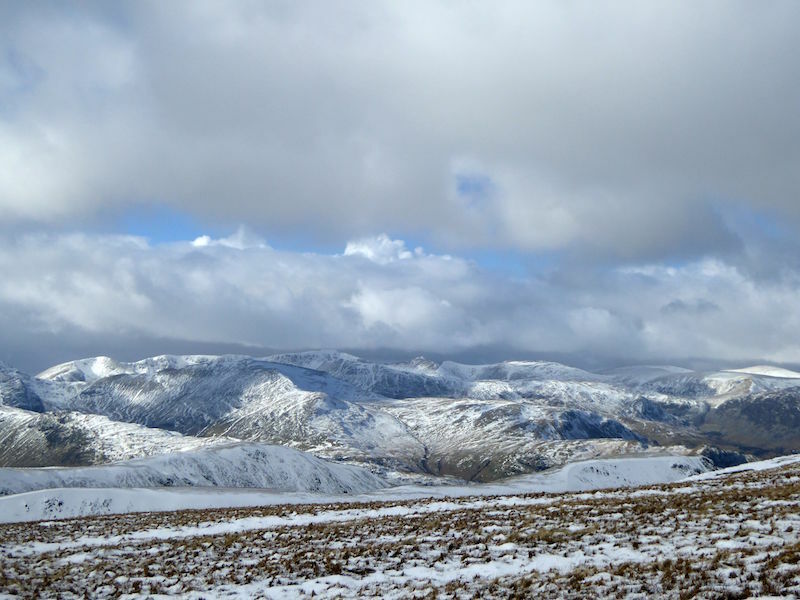 Looking over Hartsop Dodd at the fells to the west of Thornthwaite Beacon. 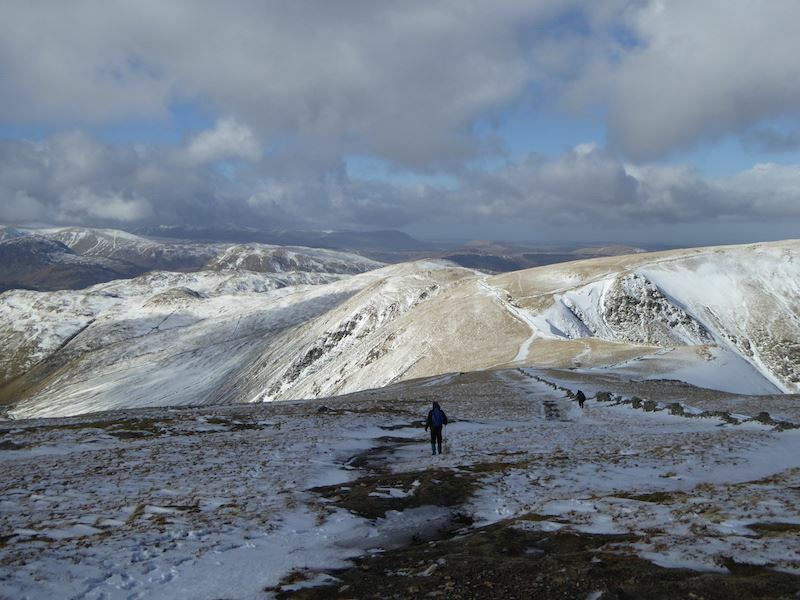 Walking over to High Street from the beacon and looking down to Hayeswater and the very ominous looking clouds above it. 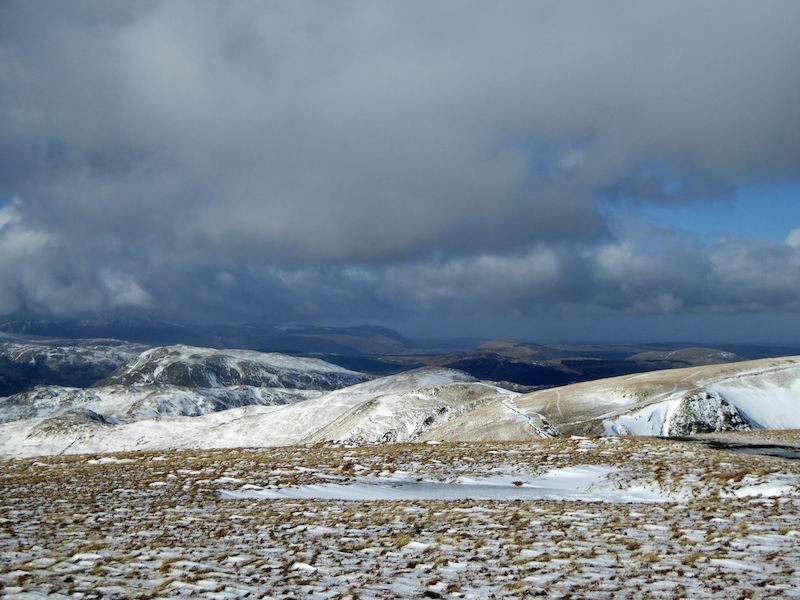 Rest Dodd in the centre, to the right of it is The Knott and to the right of that are The Straits of Riggindale. 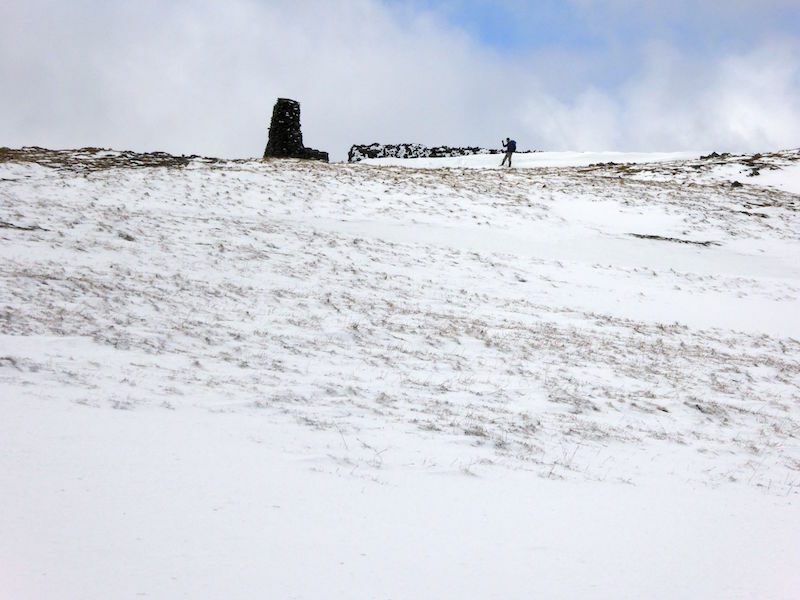 A close up shot of a walker taking a photograph of Thornthwaite Beacon. Very icy along the High Street path. 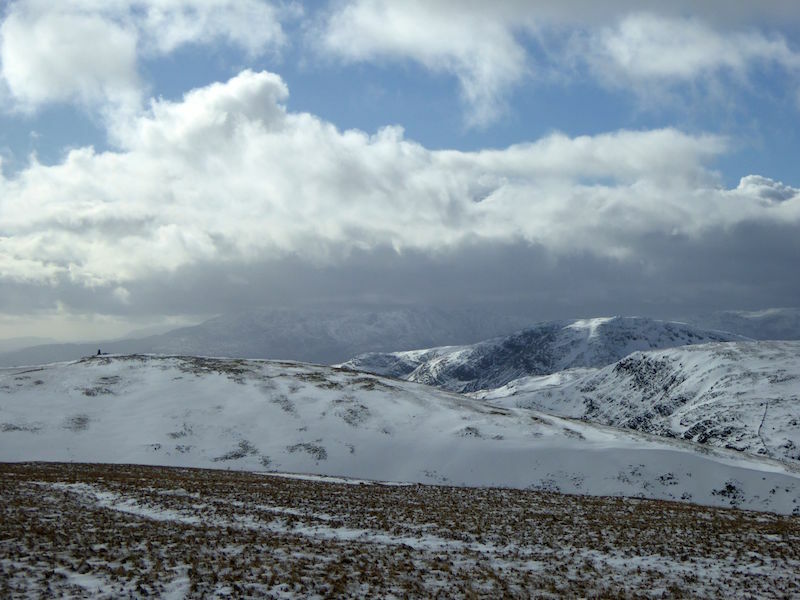 Over to our right is one section of the Kentmere Horseshoe. 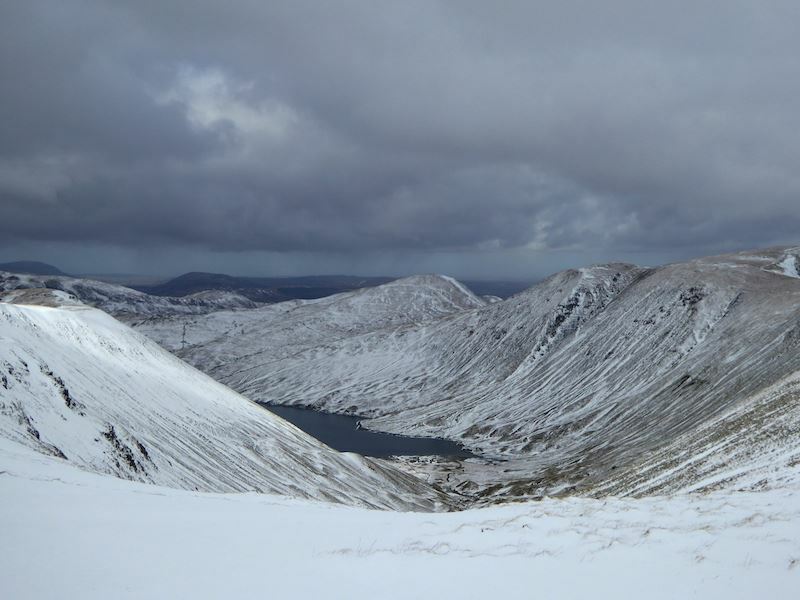 In the centre is Ill Bell, on its right is Froswick, and on its left is Yoke. 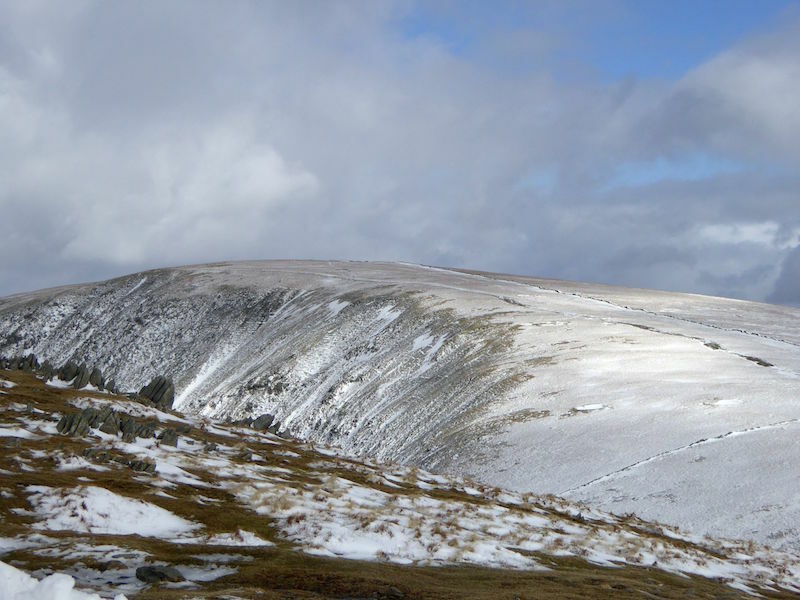 A longer view back to the beacon from the path to High Street. The view to the west from the path to High Street. A view slightly more towards the north west from the path along High Street. 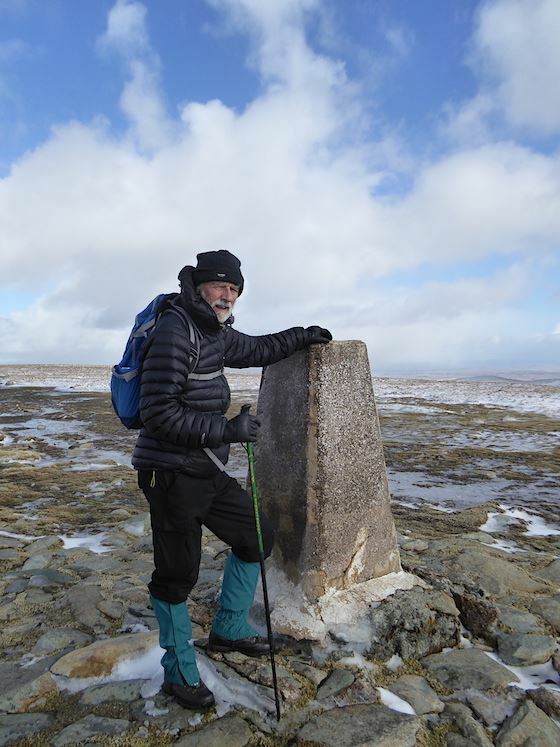 Blimey, here we are at the trig point on High Street and there’s not a soul around. That’s a first, this place is usually full of folk. Verglas covering the wall along High Street. Man modelling green gaiters. OK, so they’re not the most fashionable of items but they do stop the snow getting into your boots, soaking your socks and giving you wet, cold feet. 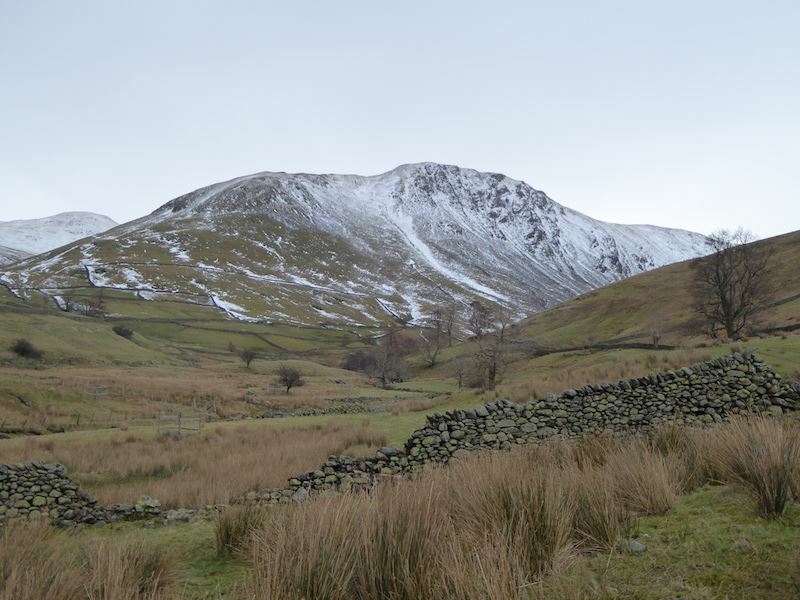 From High Street a view of Kidsty Pike, with the dark tip, and to the left of it is High Raise. From High Street another view of the fells to the west. 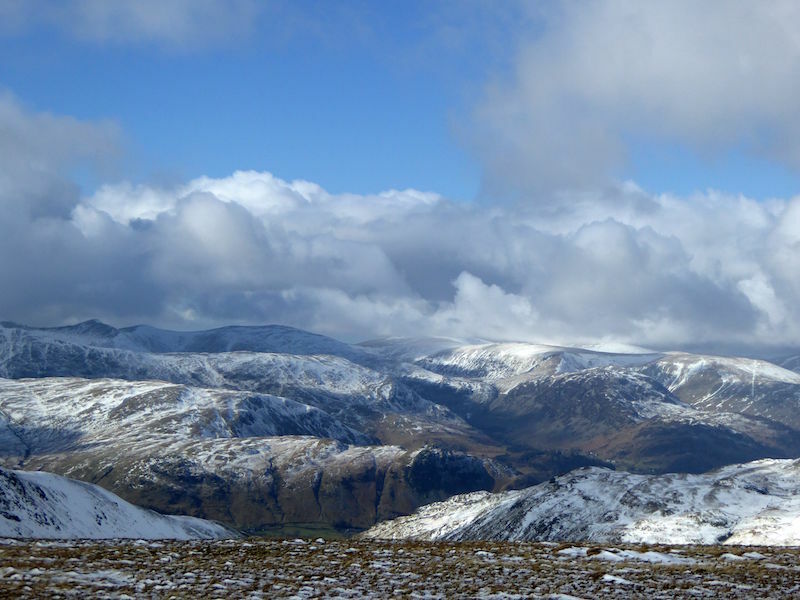 The dark mass to the centre right is Saint Sunday Crag with Helvellyn behind it on the far right. 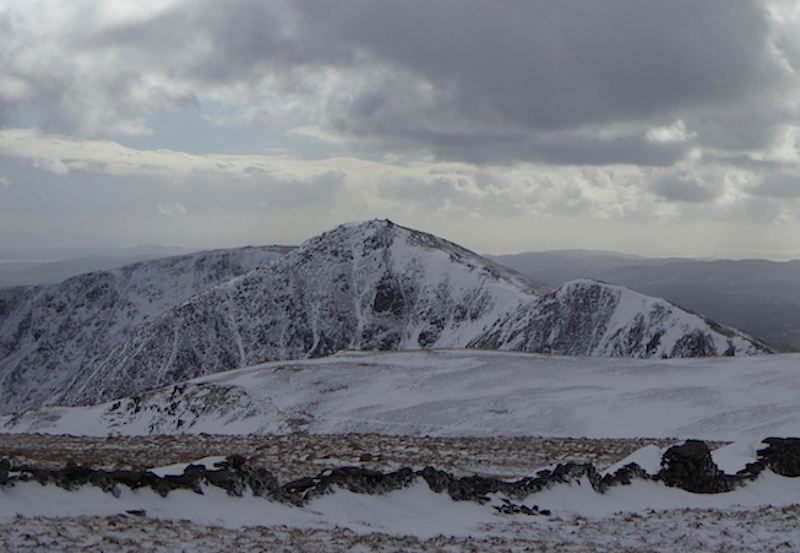 Looking northwards with The Knott in the centre and Rest Dodd just behind it. 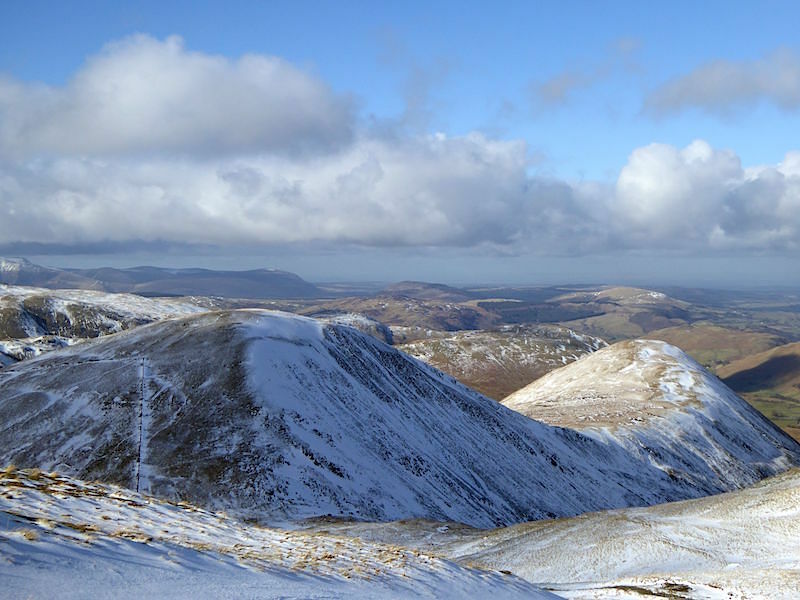 The fells beyond to the north are largely snow free. 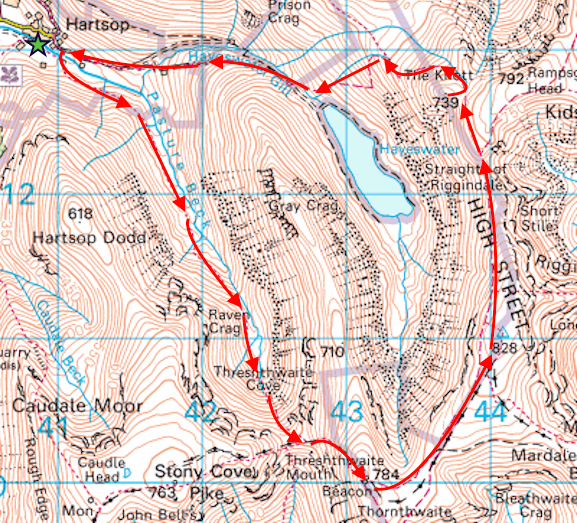 Making our way down to The Straits of Riggindale and meeting two other walkers making their way up. 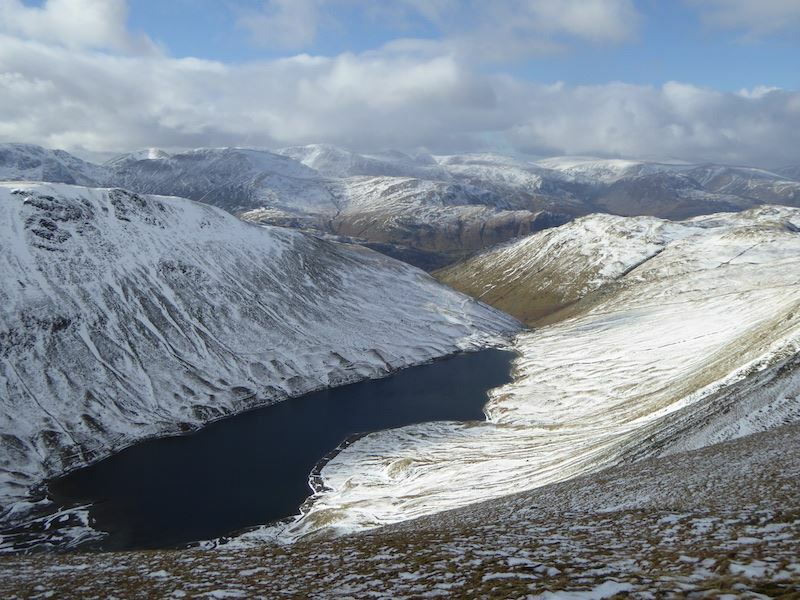 Hayeswater and a wonderful view beyond it. 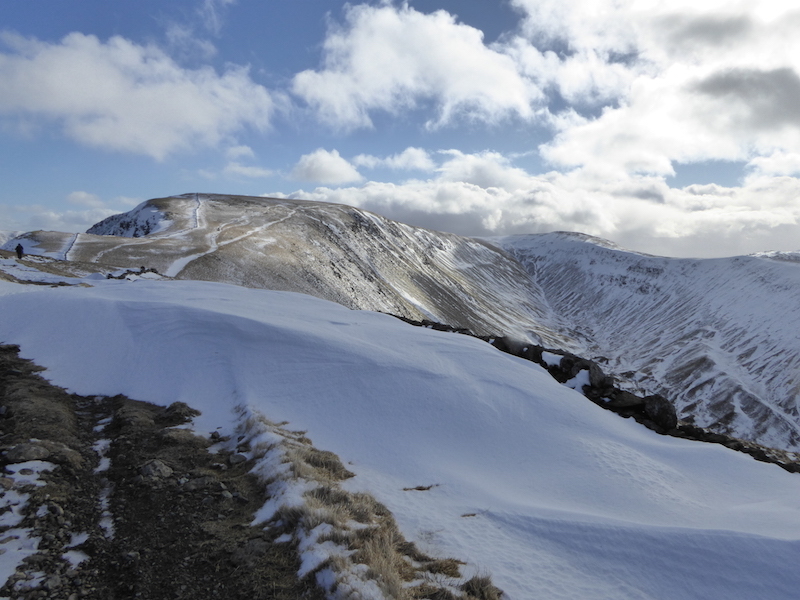 Snowdrifts across the path from High Street to The Knott. The path is somewhere under that lot, we didn’t go looking for it. 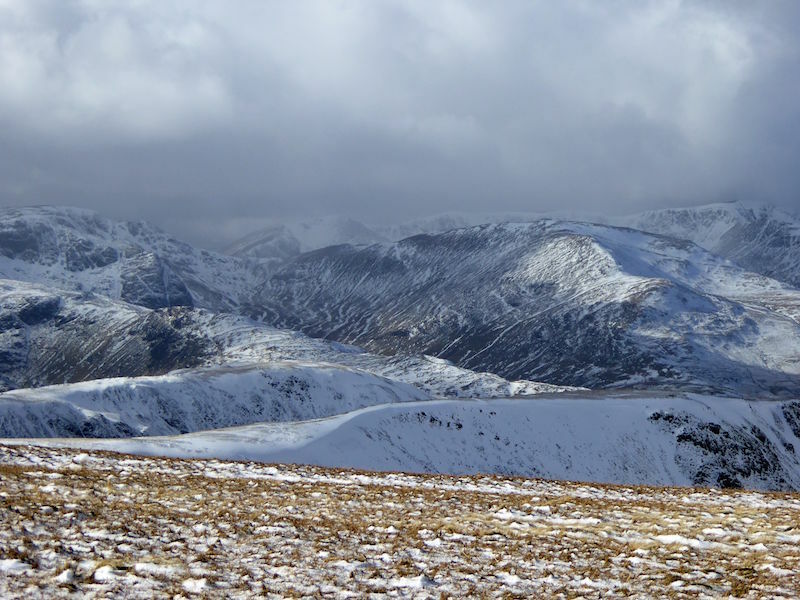 From The Knott, the dark crags on the right lead to Rampsgill Head. 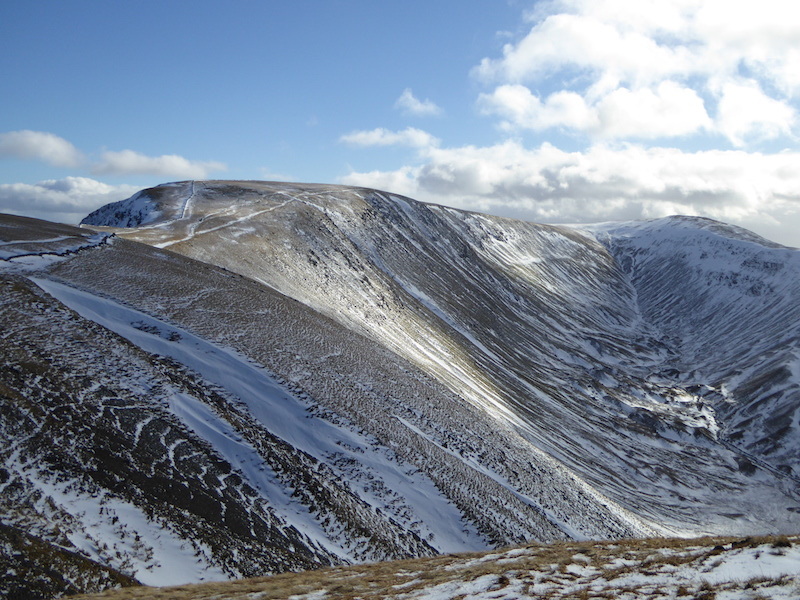 Below them on the left is High Raise and the ridge which leads down to Wether Hill and Loadpot Hill. 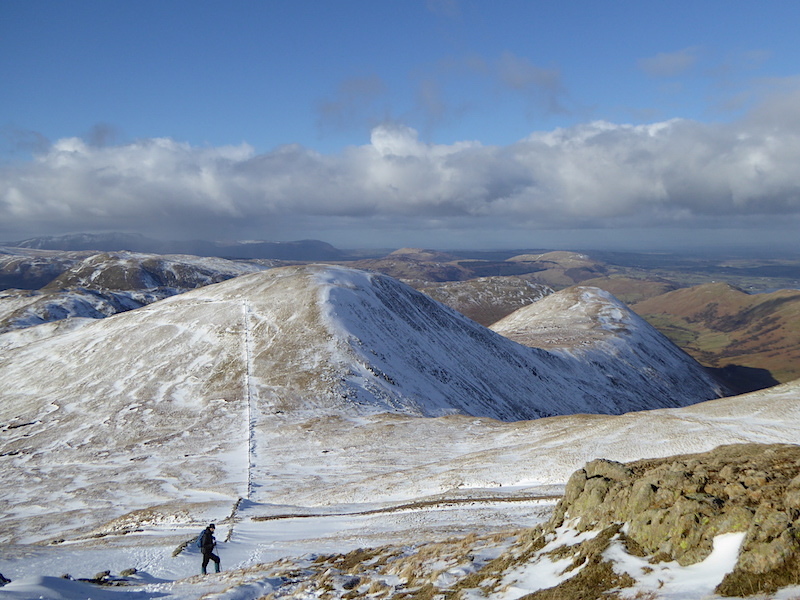 Rest Dodd and The Nab from The Knott. Zooming in on Steel Knotts, to the left, with its distinctive top of Pikeawassa. 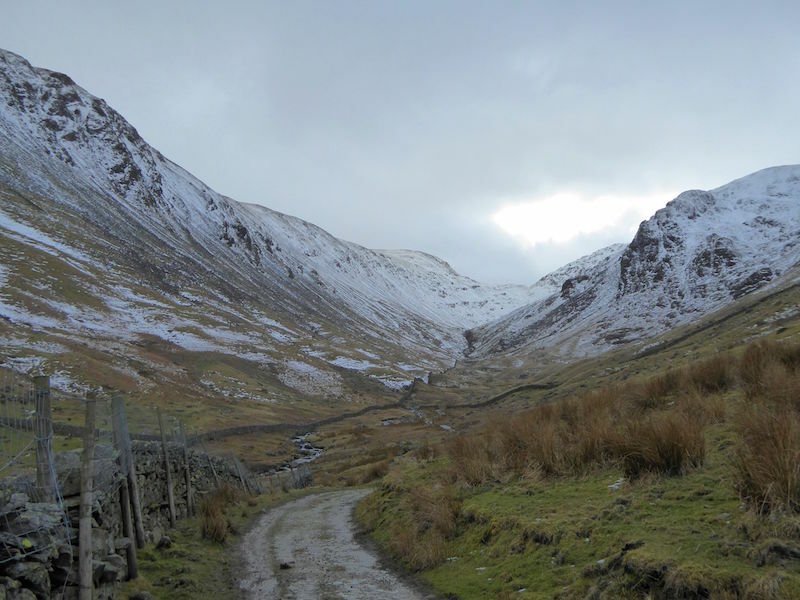 From The Knott a look back to High Street and a view along Hayeswater Gill. 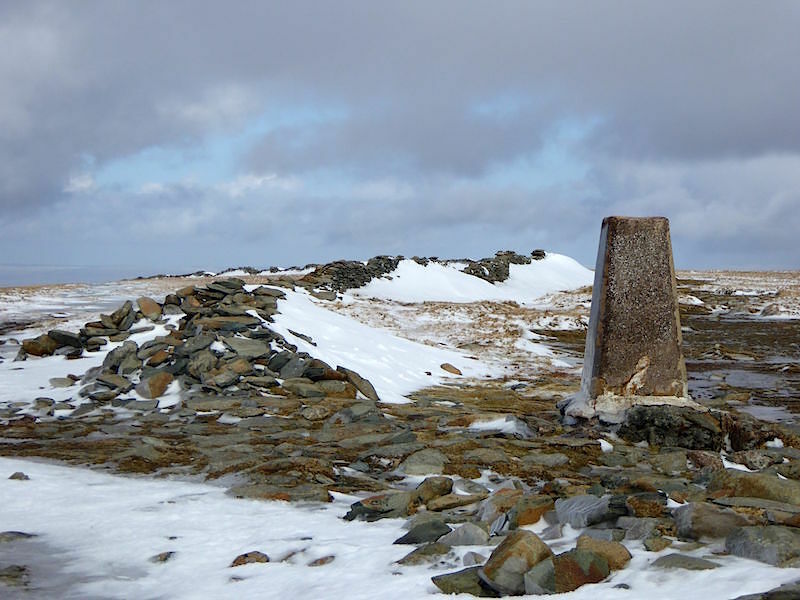 The summit cairn on The Knott. The sun is out, the wind had dropped and its all downhill from here, that’s put a smile on my face. 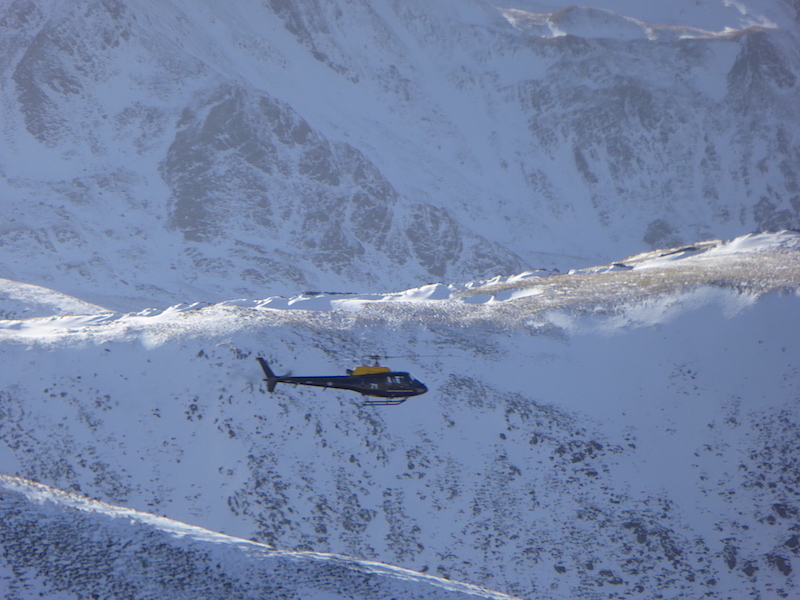 This helicopter was flying around for a while, possibly doing a training exercise. 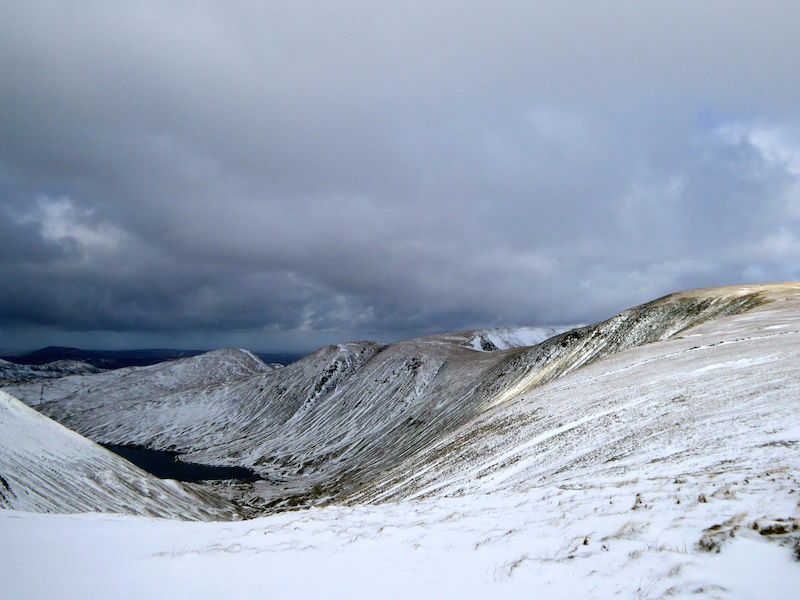 Rest Dodd and The Nab. 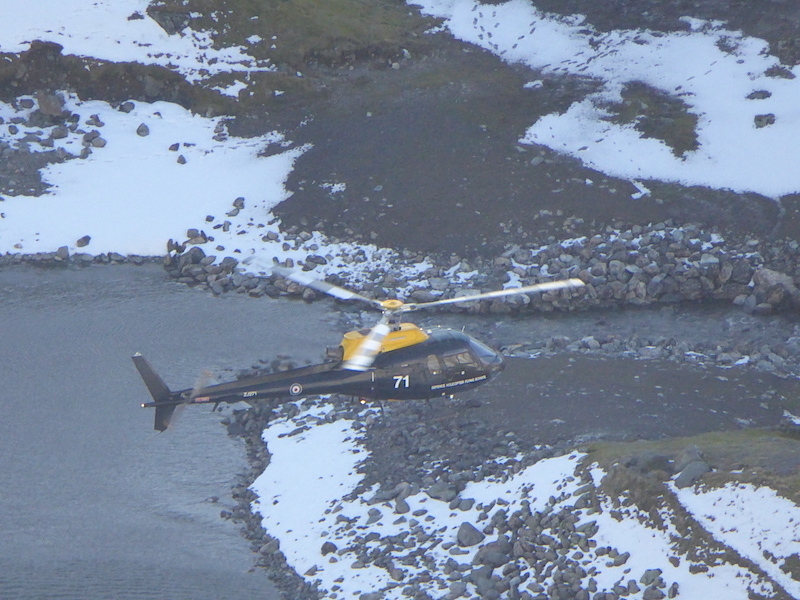 There’s the helicopter again, nice of the pilot to hover over Hayeswater outlow for a few minutes so I could get a good shot. 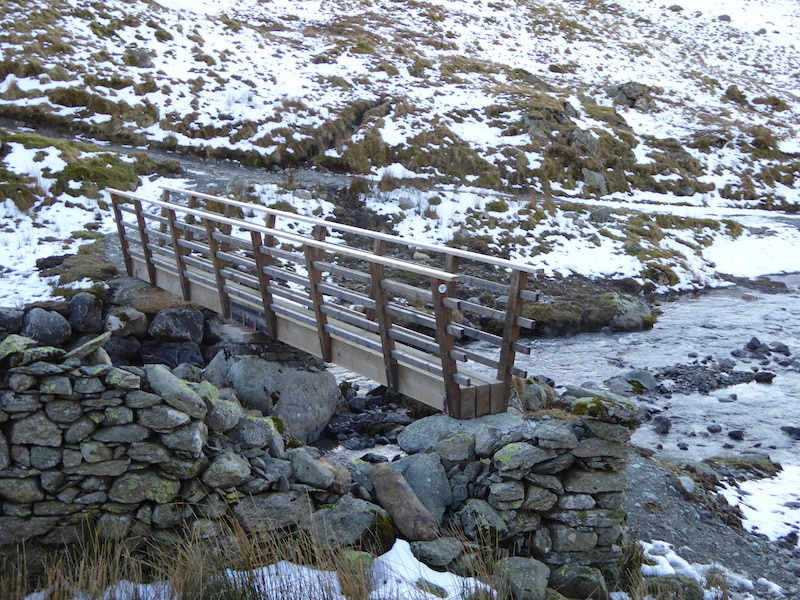 Now that the dam has been removed at Hayeswater a bridge has been provided further down the gill. 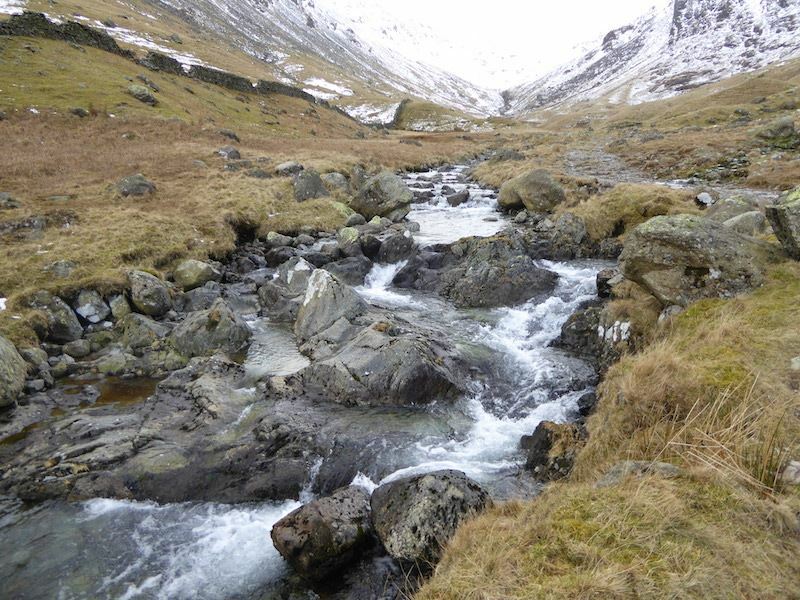 Lots of water flowing down the waterfalls in Hayeswater gill today, anyone for a paddle? 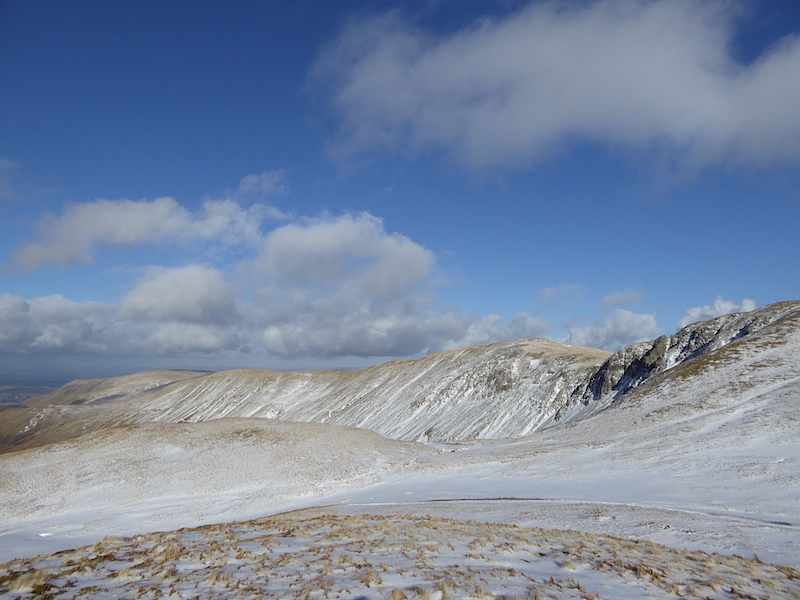 Almost back at Hartsop and a view of Saint Sunday Crag beyond the dark mass of Hartsop above How. 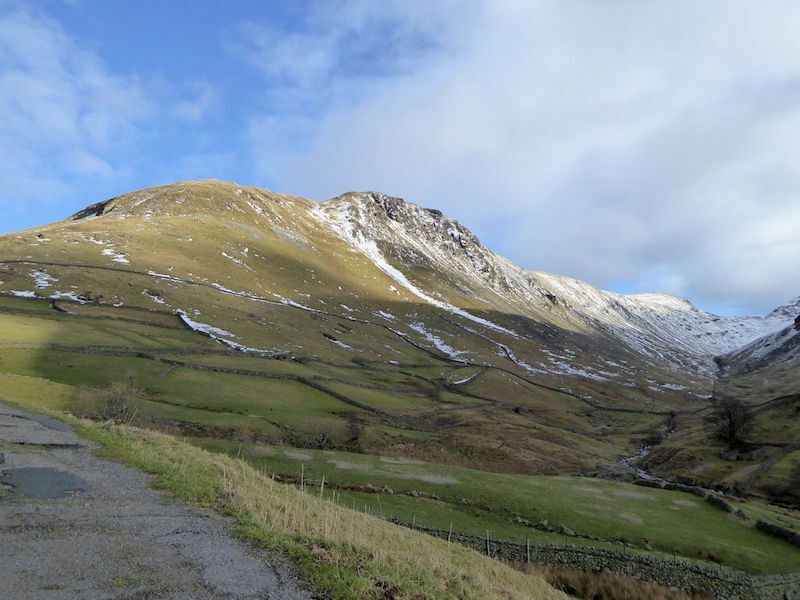 Finally, before we reach the car park, a look back at Gray Crag bathed in afternoon sunshine. 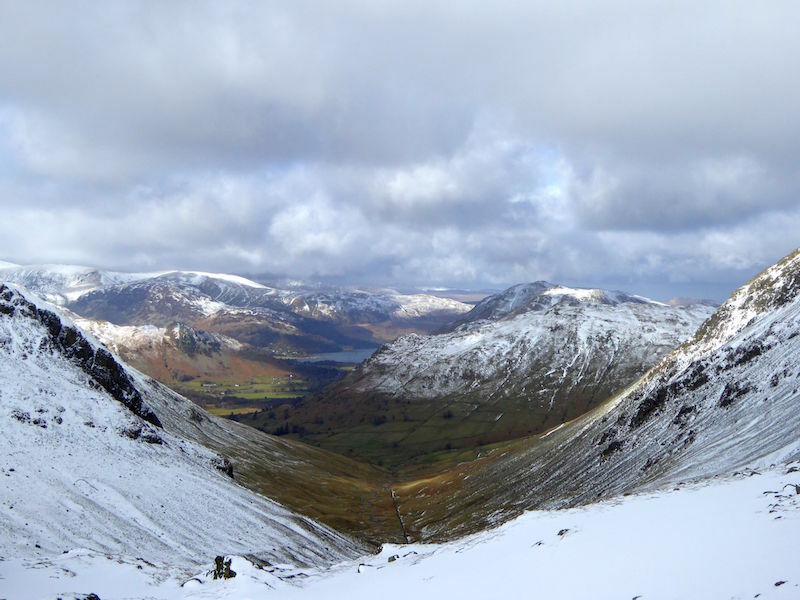 Over on the right is the steep, snow covered climb up to Threshthwaite Mouth which we did this morning. That was a grand day out, wasn’t it Gromit?